This artist's concept shows a vertical view of NASA's Space Launch System on the launch pad. NASA announced plans today (Sept. 14) for a new giant rocket that will one day carry astronauts on deep space missions to destinations such as an asteroid or Mars. The next-generation launch vehicle is expected to be the most powerful rocket ever built, capable of taking human explorers to targets further in space than ever before, agency officials said. NASA intends to use the new Space Launch System (SLS) to fulfill a variety of launch capabilities, ranging from carrying 70 metric tons of material into space at first, to eventually being capable of hauling 130 metric tons, which is between 10 to 20 percent more thrust than the Saturn V rockets used to launch the Apollo moon missions in the late 1960s and early 1970s, agency officials said. "It's fair to call this the largest rocket, most powerful rocket," Bill Gerstenmaier, associate administrator for NASA's Human Exploration and Operations Mission Directorate said in a news briefing today. The massive SLS will incorporate some hardware from the space shuttles and the now-cancelled Constellation program that was originally intended to send astronauts back to the moon. The Constellation program, which included designs for a heavy-lift rocket, called Ares V, was scrapped in 2010 by President Barack Obama in favor of focusing on visiting destinations deeper in space. 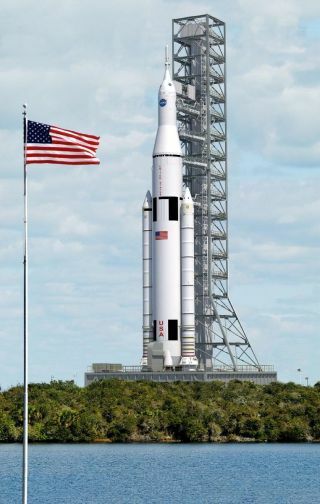 The $10 billion SLS booster is expected to be the most powerful rocket ever built, surpassing even NASA's Saturn V family of rockets that carried astronauts to the moon during the Apollo program. The last Apollo moon mission was in 1972. In April, private spaceship maker SpaceX announced plans for its own unmanned heavy-lift rocket, which would be the most powerful commercial booster ever built. SpaceX's so-called Falcon Heavy is being designed to haul up to 53 metric tons of cargo into low-Earth orbit, which is still less than the projected capability of SLS.